Dads are notoriously hard to shop for, and with Father’s Day approaching on Sunday, June 18, we don’t want you to fall into the trap of overspending to make his day special. You don’t need to spend a lot of money to make your dad’s Father’s Day unforgettable. Whether you’re throwing a Father’s Day party, giving an awesome dad-specific gift, or gifting your dad an experience instead of something material, we’ve got several ideas below to help you make the most while spending the last. Throwing a Father’s Day party for your old man doesn’t have to mean spending lots. For food, make it a pot luck and spread the cost across your family members or friends. Everyone saves and everyone gets to eat what they like – it’s a win-win. The same can apply for drinks and alcoholic beverages, which can become very costly very quickly when you’re purchasing in bulk. When each friend or family member brings their own, you’ll save a lot of money on your Father’s Day party. As far as entertainment goes, there are lots of ways to use what you already have to entertain dad. Is his favorite team playing? All you have to do is turn on the game. Maybe he’s a music buff? Make a custom playlist for him and plug it in at the party. Is he a golfer? Get creative with paper cups and household items to make your own challenging putt-putt course. Your creativity will make this the Father’s Day party of the century! Dads are hard to shop for, and when you hand-make his Father’s Day gift, you’ll save money and show him how much he means to you. There are tons, literally tons, of ideas for D.I.Y. Father’s Day gifts on Pinterest and other online sites that can inspire you. Whether the gift is from his child, his grandchild, his wife, or his siblings, there’s something handmade for everyone to give. Have your children make cards with construction paper and crayons. Chances are you already have these around the house, and if not, the cost isn’t too high. You can also buy a plain picture frame and decorate it with sticks, marbles, or stones. Pop in a picture of dad with his family and voila – you’ve got a D.I.Y. Father’s Day gift that will touch his heart. Handmade “coupons” are also always a crowd-pleaser, and for dad, you can have prizes like a foot massage, free hug, or a whole day with you, distraction free. Sometimes, the best gifts you can give aren’t material things at all, and the same goes for Father’s Day. If your dad never takes a day off, the best gift you can give him is a day to himself to relax outside in the hammock with a beer or to watch the game and play poker with his buddies in his man-cave. If you don’t get to spend much time with your dad, giving him a whole day with you – especially one that he gets to call the shots on – might be the best gift he’s ever gotten. When you give your dad an experience, you’re giving him a Father’s Day gift he’ll never forget. 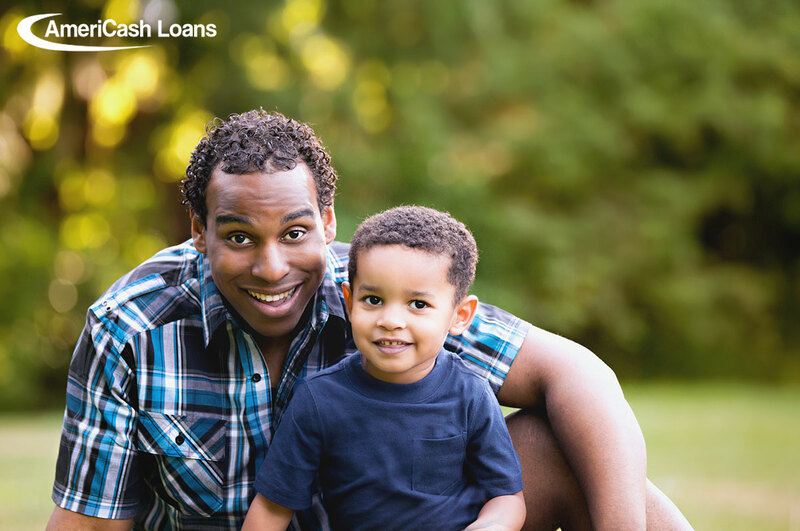 If your dad has had his eye on something special for a while, and you can’t think of a better Father’s Day gift, AmeriCash Loans can help. Apply in-store or online today for the extra cash you need to make your dad’s day as special as possible.